In terms of quantity of photographs, my trip last week to Chiricahua National Monument and parts of Coronado National Forest was not particularly productive. 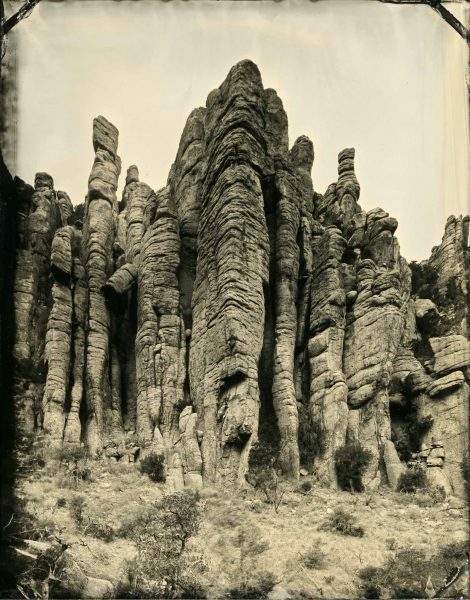 What I lacked in quantity, though, I feel like I made up for in quality: I really love the way the rocks of the Chiricahuas look, rendered as a tintype. Wednesday, the first day of the three-day trip, was spent scouting locations in the Tucson Mountain District of Saguaro National Park (I hadn’t been in that western section of the park, yet) and then getting to and scouting out Chiricahua National Monument. Since it’s about as far south and east as you can get in Arizona without being in either Old or New Mexico, I barely had time to get down there, do all that looking around, and find a campsite outside of the park in the National Forest before dark. Since I was already up the mountain road east of the monument, I spent Thursday morning checking out a couple of supposed ghost towns – Paradise and Hilltop – and then drove on around and over the Apache Pass near Ft. Bowie National Historic Site. Unfortunately (for the purpose of photographing ghost towns) Paradise seems to be a very-much alive enclave, and Hilltop is apparently on private property, behind several “No Trespassing” signs. So that side trip was a bust. I finally got back to Chiricahua NM, to a specific spot I had scouted out, ready to start making tintypes, only to find a film crew there making an advertisement for some SUV. I tried to work in another location until they finished, but was not excited about it. By the time the film crew moved on, the sun had nearly dropped below a ridge, and my day of tintyping was over before it really started. As an aside, I’ve noticed a challenge when making tintypes of places like Chiricahua NM and Bryce Canyon NP: many of the iconic images of these formations are made from within the field of rock columns. 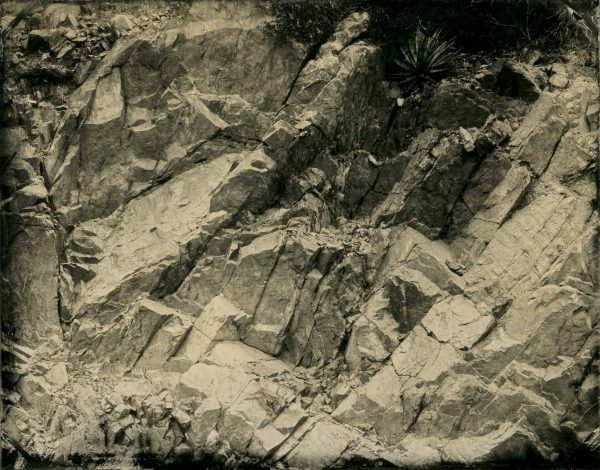 My current tintype setup requires me to be somewhat close to my car and the darkbox in its trunk, and especially in Chiricahua, I can’t hike the several miles needed to get into the heart of the park. I suspect the next move will be to get a small folding cart, so that I can load my darkbox, a jug of water, and my camera on it and get away from the parking lots and pullouts. 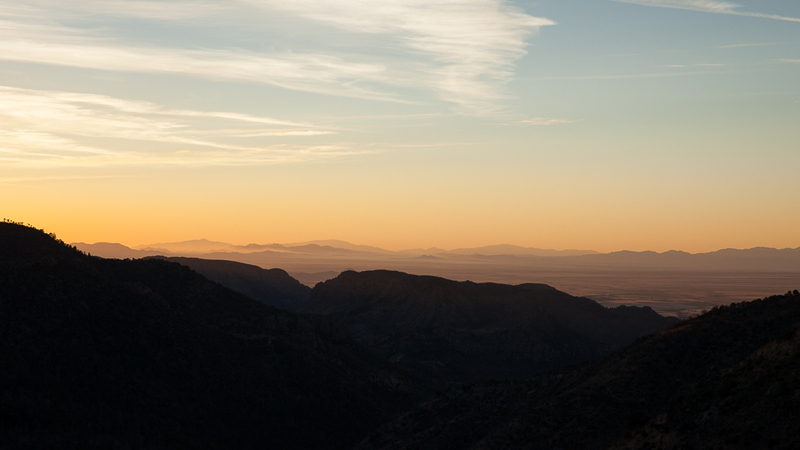 Anyhow, if you’ve been to Chiricahua NM, and think “these photos don’t look like what I remember”, that’s why. Friday morning I got up and back into the park nice and early, and got set up in my chosen spot – the Organ Pipe Formations – and the vertical tintype above was one of the first plates of the day. Seeing the texture of the rocks, the towers and overhangs – and that little bit that has fallen over – made me feel better about the lack of progress the previous two days. After a while working on the vertical composition I moved a bit to my right, squeezed myself against the opposing canyon wall, and got as much of the Organ Pipes into the horizontal frame (at the top of the post) as I could. I took the long route back to Tempe, by way of driving up Mt. Graham. Made it to 9200ft before the pavement ended and the road was closed for the season. On the way back down the mountain I stopped and made a few tintypes of the rocks along the side of the road. So while I only got three different photographs from the three-day trip, I like them enough – especially the Organ Pipe images – that I feel the trip wasn’t a total waste. Besides, spending three days exploring new terrain is pretty good all by itself! 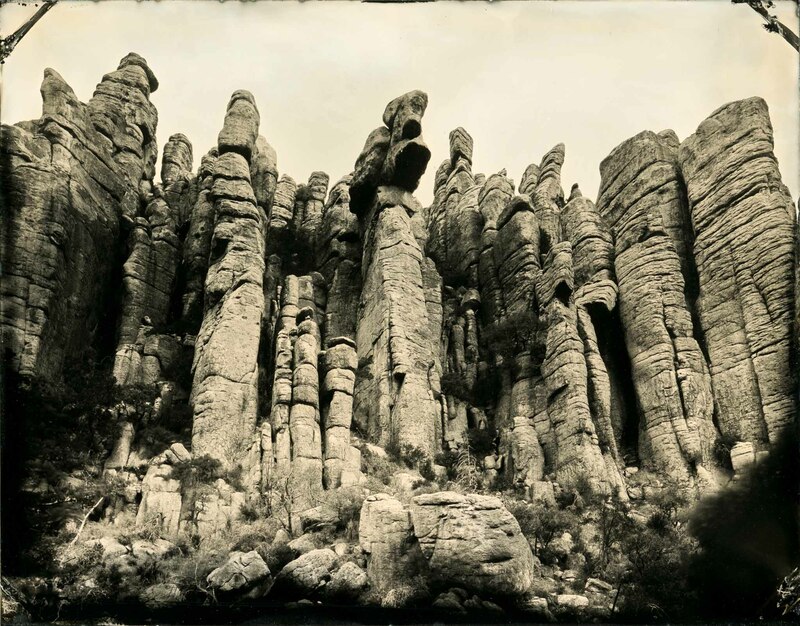 March 6, 2017 | Filed under Historical Processes, Landscapes, Tintypes, Travel. Great pictures. I may need to explore Arizona someday.